Tomorrow’s St. Patrick’s Day, a great reason to celebrate All Things Irish-ish! To celebrate a day early, I thought I’d show you a wee bit of Irish Inspiration, in the form of a lovely piece of tambour embroidery worked by a reader. I really love what she did with the this embroidery pattern! 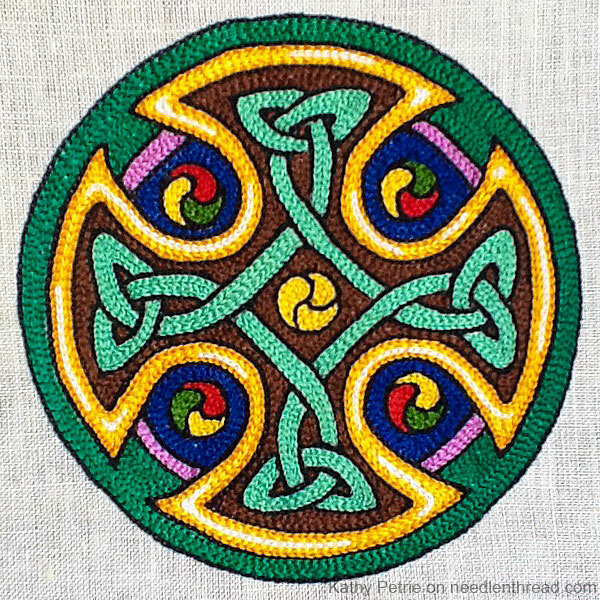 Using this Celtic Cross embroidery pattern, Kathy worked the design using a tambour hook and Anchor coton a broder. The outlines in black are worked with #12 perle cotton. Kathy made a great choice for her first tambour embroidery project! The intertwining lines and the circular outside border and the shape of the cross are all particularly well-suited to tambour embroidery, because you can just keep going around the design. Until you get to the point of filling in the tighter spaces (and except for the little round knots), there’s not a lot of starting and stopping – even through there are a few sharp turns. I especially like the way she incorporated the white into the yellow-gold on the cross design. It’s a very nice touch that keeps the embroidery from looking flat. If you’d like to try your hand at tambour embroidery, you’ll find further information, tutorials (including a video tutorial), book reviews, and projects all listed in the Tambour Embroidery Index here on Needle ‘n Thread. And you’ll find plenty of free embroidery patterns to practice on, here. Another option that would work well for tambour embroidery – especially if you like monograms – is the Celtic Knotwork monogram alphabet here on Needle ‘n Thread. The continuous intertwining lines of the letters would work up quickly with a tambour hook! And if you’re hunting about for St. Patrick’s Day embroidery ideas in general, you might enjoy this article demonstrating very simple (and quick to work!) shamrocks in whitework on green linen. Just find a simple line drawing of a shamrock from online clipart or coloring book pages, and you’re good to go! Thus endeth the Morning Missive. Have a Magnificent Monday! You did a beautiful piece. How will you finish this embroidery? Frame it, make it into a pillow? What is your next tambour project? Thank you to everyone for the kind words! I loved mastering this technique (well, maybe not in the very beginning %#! @$) and was amazed at how quickly the cross worked up. The piece will probably get framed. I got started on tambour because I was going to make some small linens for my church’s altar guild (purificators, for those familiar), and my hand-embroidered itty bitty chain stitch crosses just looked really sad. Tambour ought to be much easier to control for stitch size and clean lines. Next up is to try tambouring an icon or one of those opus anglicanum saints, so I’m eager for Mary to get going on her Christ embroidery and lead the way with color choices and guidance. Beautiful. Love the design, the colors. Good job. Oh, that is so lovely! Such nice work, and I agree with you about the white. Well done Kathy! Thank you very much for showing this fantastic piece of tambour embroidery. The technique is on my bucket list. In May, I hope to attend a class with Elisabeth Roulleau at ArtTextil in Dachau, Germany. Hi, Jen – No, it’s not really like punch needle. This makes a chain stitch, and handling the needle itself is a little more complex. Punch needle is essentially just a punch in and out of the fabric – although it does take some getting used to, to get a nice effect. For a 10 year old, I’d go with punch needle. Wow, that’s her FIRST tambour!? Kathy, excellent work!! The white really does make it look as though the gold is shining. I just love this design – but it’s not just Irish. I’m Welsh and very proud of it. We have a wonderful Celtic heritage which is shared with the Irish, Cornish, and Scots as the original inhabitants of the British Isles. I can see this design worked in all sorts of ways and colours depending on which British Nationality it is planned to represent – but I love it just because of it’s design. I love celtic designs and your colors choice is very good. I’m late today I have been lunching with a friend now to get down to some embroidery I have to rip out some stitching which is not going to be easy as I’ve made a mistake. Anyway a lovely piece of Tambour embroidery, I can’t believe it’s your first Tambour embroidery attempt it is beautiful. I love the colours you have chosen they blend in perfectly and the Celtic Cross is really appropriate for St Patrick’s day well done Kathy. I agree with you Mary that the white in the gold is a lovely touch. I must try more Tambour embroidery as I really enjoyed it the only problem I had was how to start a new row. Good luck with the Icon. Thanks Mary for sharing with us this lovely piece to Tambour embroidery have a great day. Beautiful work Kathy! I love your colour choices. It’s so bright and vibrant. Well that is just stunning! Considering it is done “upside down” so to speak where you can’t see what you’re doing, as it is linen that it is worked on instead of a sheer fabric like organza, it is incredibly neat and exact!! I hope to be able to do it as well one day. I’ve been toying with tambour myself for my Church too and have tried both the tambour needle and also the Clover Katan Couture Bead Embroidery Tool. I have just ordered Aari needles from the London Embroidery School to try next. Kathy, did you use the Tambour Hook or one of the other ones I mentioned above? Kathy’s cross captures the rich colors of illuminated manuscripts. Thanks for sharing. Absolutely beautiful, Kathy, and thanks to you and Mary for brightening up this day. Previous Previous post: Favorite Embroidery Tools – Your Input, Please!